The Walt Disney crew have been up and down the animation ladder for a few years now (the underrated Princess and the Frog, the ‘only ok’ Tangled and the ‘did anyone even bother?’ Winnie the Pooh) and their latest outing – which has actually been in and out of development since the 80s (!) – is a surprising delight, and I found myself laughing without irony or guilt and being genuinely moved by characters I cared about. 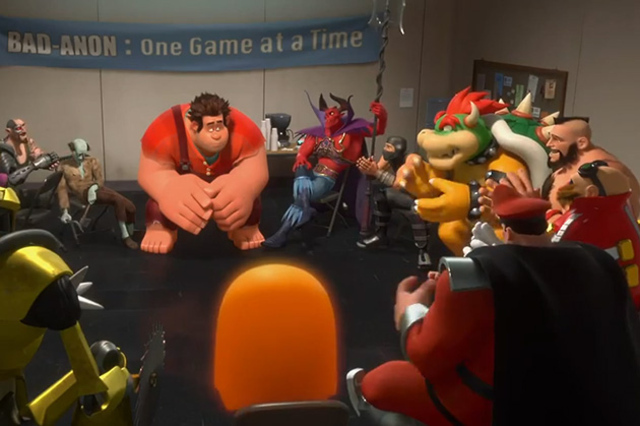 In Wreck-It Ralph, Disney had a rare injection of intelligence that may or may not have to do with their poaching of some Pixar talent, but nonetheless it is very welcome in my heart. Ralph is a video game bad guy, along the likes of Bowser, the ghosts from Pac Man, Diablo, etc (all of whom he attends enemy anonymous meetings with) who is sick and tired of sitting in his pile of rocks while the good guy of his game, Fix it Felix, gets all the awards and accolades and parties and adoration. He makes it his goal to get a medal of his own and this leads him on an awry mission to a flashy new video game called Hero’s Duty, where he inadvertently picks up a virus and accidentally deposits it in an another video game, the unsuspecting Sugar Rush. Here he discovers the odd character Vanellope who is not who she seems. In his quest to get back his medal he must tread the path of the hero, but for poor hapless Ralph it is no easy feat. This is the most fun I have had in a movie in a long time. For anyone who even looked through the window of an arcade, there are enough in-jokes to last a lifetime of laughs. There is a subtle stab at modern video games (Ralph, from one of the original arcade games, ventures into the guns and aliens Hero’s Duty, and exclaims “When did games get so violent? !”) and the attention to detail is delightfully Pixarish – the ‘Grand Central Station’ of the arcade is the power board everything is switched in to; the endless amounts of jokes in Sugar Rush, my personal favourite being the Oreo guards – and you know from the get go this film is not only a sweet homage to villains everywhere, it is a love song to vintage video games and these great childhood memories. Great witty characters like King Candy help pepper the field of fun. The only issue I have, and it is one I have with modern animated films in general, is voice casting. Jane Lynch, John C Reilly and Jack McBrayer are great talented actors, but as voice actors they cannot simply talk in to the microphone and not expect us to not know it’s them. It’s distracting and frustrating, and while it might seem like a draw to some to put these names on the poster, I feel like it is an unnecessary deterrent to otherwise fine characters. By contrast, Sarah Silverman and Alan Tudyk voice two main roles but alter their voice in a way that gives shape to the character and I didn’t ever once feel like I was watching them on screen, simply the characters as they are written and drawn. I long for the day when voice work was done by voice actors, who are trained in the art, and not simply by recognisable names to help sell a film. That aside, the real star of the show is the animation, which is flawlessly arrested to suit the styles of the differing video games – the older arcade games so pixelated they are squarish in shape and movement so it is an absolute delight to see them in action – and never ceased to make me giggle. It is revolutionarily flawless. The script too is tightly written, and delivered nicely with well suited humour that refuses to sink to the lower level of the idiot children of today, and quite heartfelt too, I will admit that at times it was genuinely moving and the final line of the film hit me hard and left a quiver in my heart. Nostalgic in its core, this is one that will stick around for the long haul and a welcome return to the top for the big D. Let’s see how long it lasts. 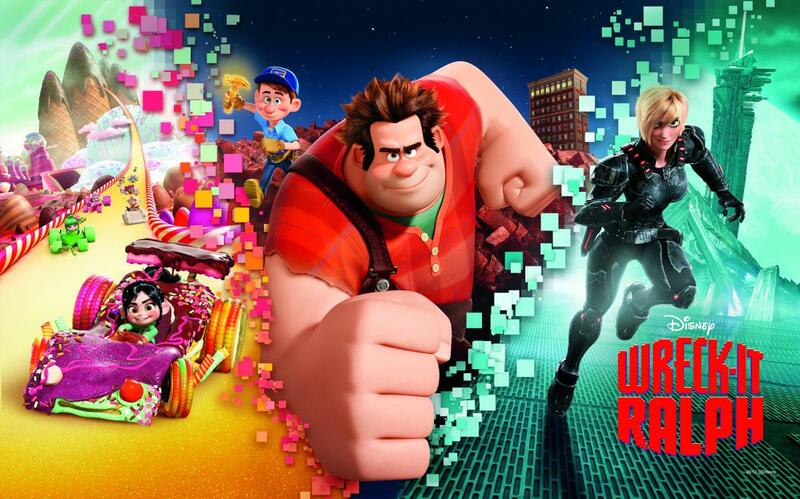 This entry was posted in Film, Gaming (Video), Generally Geeky, Reviews and tagged Alan Tudyk, arcade games, Disney, Jack McBrayer, Jane Lynch, John C Reilly, Sarah Silverman, voice acting, Wreck-It Ralph. Bookmark the permalink.